In this recession, the majority of small business owners have 101 business decisions to worry about followed by the bank manager. The last thing they have on their mind is an Environmental Management System. However, in terms of environmental liability, there is one clear difference between this recession and the last one. That difference is the polluter pays principle. Put simply, this principle places the ownership of waste firmly with the producer regardless of who did what. This means that as a producer of waste you are responsible for it from cradle to grave. 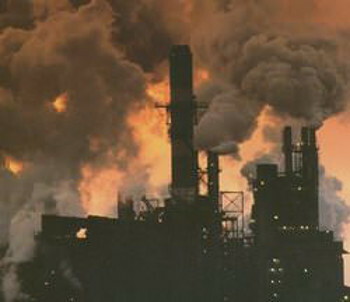 Air PollutionThe polluter pays principle makes the party responsible for producing pollution responsible for paying for any damage done to the environment. If your waste causes pollution at some point in the future and this waste is traced back to your company then you have a problem. Now you may well ask what has all this got to do with an Environmental Management System. Well ask yourself this question, if you cast your mind back six years ago, could you detail all the waste that was produced by your company? Could your company detail all the waste facilities that accepted your waste and provide recycling or disposal certificates for the waste? These may be a difficult question to answer. However, if you were requested to produce a set of accounts for 2006, the answer may be very different. In Ireland, to dispose of waste as in most EU Countries, the producer must firstly identify the waste correctly. The European Waste Catalogue and Hazardous Waste list provides a unique European Waste Catalogue Code (EWC code) to identify the waste type. The first part of the EWC code identifies the sector that produces the waste. There are numerous sources to find out about EWC codes and one such source can be found from the following hyperlink. Once a company has identified the waste type, the next step is to get an authorised waste collector to collect the waste. A waste collector can only collect waste if they have a valid waste collection permit for the respective type of waste listed under the EWC code. Waste collections permits are normally issued by the regional or local governments and will bear the name of the waste collector, an issue date and an expiry date. Each waste collection permit will have various conditions that may change from region to region but for the most part, these conditions will seek to impose best practice upon the waste collector. Where a company is shipping hazardous waste for disposal, they must ensure the waste collector collecting the hazardous waste is compliant with the ADR regulations.The European Communities (Carriage of Dangerous Goods by Road and Use of Transportable Pressure Equipment) Regulations, 2011 (S.I. 349 of 2011) apply to the carriage of dangerous goods by road in tanks, bulk and packages, including the related packing, loading, filling and unloading of the dangerous goods. The waste collector receiving hazardous waste must ensure they are authorised to collect the waste and adhere to the ADR regulations. The ADR regulations cover everything in regard to shipping of hazardous goods. They detail everything from the type of shipping container that is required right through to the label on the container, the loading plan, the load documentation, the safety equipment on board the transporting vehicle and the ADR licence that is required by the driver. Additional information regarding the ADR regulations can be obtained from a number of sources one of which is UNECE (United Nations Economic Commission for Europe) http://www.unece.org/trans/danger/danger.html. Finally the waste collection company must take your waste to an authorised waste facility that is licenced to accept the waste. Waste disposal facilities may have a waste permit issued by the local government. The majority of waste permits issued by the local government will not accept hazardous waste. Additionally, waste permit facilities may be restricted in terms of the volume of waste they can accept. The Environmental Protection Agency is responsible for the issue of waste licences to waste operators that can accept hazardous waste. These waste licences are more complex, deal with larger waste facilities accepting different waste types ranging from hazardous to non-hazardous and the environmental conditions are more onerous. When a company disposes of its waste, it must get a waste disposal certificate. This certificate is confirmation from the waste disposal company that the waste collected was properly disposed. While the above may seem like a complex set of rules and regulations to dispose of waste, it is by no means exhaustive. The disposal of waste should follow best practice in industry. This brings us back to an Environmental Management System to manage the process. Environmental risks may be the last thing on your mind, however one risk that may certainly exist within the business is waste. Many small businesses will not have the resources or the skills to set up an Environmental Management system. The answer is not to ignore the risks but to put in place small systems that can deal with the bigger risks. Do something small, begin the process, show the workers in your company that this is important, and get a recycling certificate receipt for your waste. If a company wants to address the management of their waste disposal, then a simple way to do this without taking up a lot of new resources is to use your existing accounts system. It is a given that for every ton of waste disposed, an invoice will follow as sure as night follows day and an accounts system already exists to maintain these records. The name of the facility that recycled or disposed of the waste. The accounts technician then refuses to approve an invoice for payment unless the above documents are attached. In addition, the accounts technician can phone or e-mail the facility that finally accepted the waste to confirm they received the waste for disposal or recycling. There is no need to set up a new file system to store the paper work as it can be stapled to the back of the invoice. There will be no need to chase the waste collection company for the disposal certificate because they will do the chasing to get paid. This is not a complex EMS system but a simple way to put in place some form of management system immediately, not tomorrow, or next week, but today. Now accounts may not see this as part of their role. However, if you rented a car from a rental company and you used it for part of the day until you discovered the rental company had not properly insured you, would you pay the rental company? Of course you would not pay them. In fact you may never use the same rental company again because of the liability issue they exposed you to. More than likely, if the rental company called accounts to request payment of the invoice, you would gladly take the phone call and let the rental company know in no uncertain terms what you thought of them. The same is true for your waste collection company. If they do not dispose of your waste correctly, then they leave you with the liability. No matter what deal you get from your waste collection company, before you pay up make sure you get exactly what you requested which is disposal of your waste with no hidden liability. Before you pay any more invoices to your waste collector, get a copy of their liability insurance, and check it is valid and provides reasonable protection in the event of accidents or errors. The waste collection company may not be there in ten years but the insurance company may be. Check your own liability insurance company and upgrade it if necessary. Finally get into your car and call over to the company that collects your waste or the waste disposal facility. If you do not like what you see or they do not let you in, ask yourself why and think of the long-term risks?